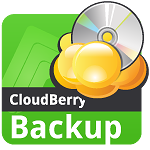 This version of CloudBerry Backup Server Edition is not available to new customers. Simple and fast backup to Amazon S3 cloud. CloudBerry Backup is a secure online backup solution that helps organizations to store backup copies of their data in online storage. It is a powerful Backup and Restore program designed to leverage Amazon S3 technology to make your disaster recovery plan simple, reliable, and affordable. Keep your backups in remote location. Access your backups anywhere where you have internet connection. Strong data encryption protects your data from unauthorized access.